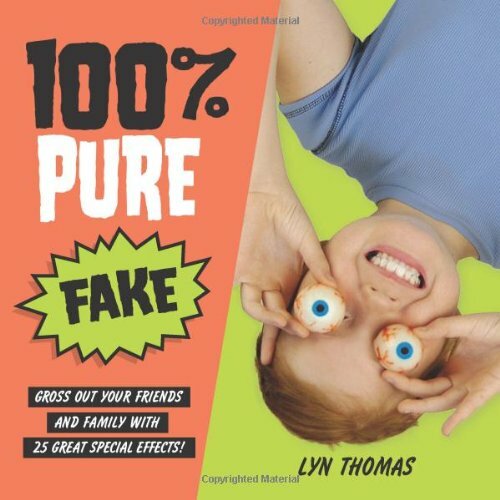 100% Pure Fake: Gross Out Your Friends and Family with 25 Great Special Effects! Parents, beware of this book. With 100% Pure Fake, the art of scaring the pants off friends and family reaches new levels of ease and sophistication. Pranksters can now amaze, alarm and totally disgust everyone with these easy-to-make Pure Fakes. These 25 safe, kid-tested recipes that can be made with ingredients found in most households, including corn syrup, rolled oats, makeup and pasta. Other ingredients, such as school glue, food coloring, tempera paint and gelatin, are widely available in grocery or craft stores. Each project is presented with step-by-step instructions and includes warnings for allergy and mess alerts, non-edible and edible projects, and when kids should get adult help. A few 100% Pure Fakes: Rotting Skin * Eggs, oats and other ingredients give kids a putridly convincing case of rotting skin. S'not Snot * Gelatin, food coloring and other ingredients create slimy matter dripping from noses? 100% pure disgusting. Chocolate Milk Spill * White school glue, brown tempera paint and other ingredients make a life-like spill that will deceive and annoy to the max!